Earlier this month, Atmel launched SAMA5D3 Cortex A5 embedded processor family, and Ronetix recently unveiled CPU modules based on the platform. 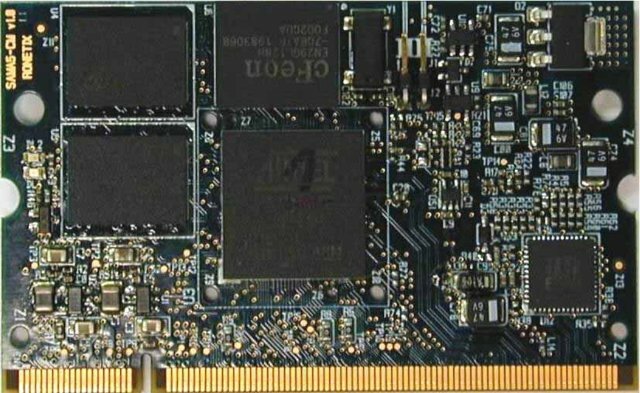 SAMA5D3x-CM are SODIMM SoM based on SAMA5D3 series processor with 512MB DDR2, 256MB NAND Flash, 4MB SPI Flash, and Gigabit Ethernet. SAMA5D3-CM boards support Linux 3.6.9 and Android 4.0. Those are actually the modules used in Atmel SAMA5D3 evaluation kits, so Linux and Android support, starter kits, as well as documentation (except schematics and PCB docs), directly point to at91.com on Ronetix website. The company can also provide PEEDI, “a JTAG Emulator and Flash Programmer capable to program in standalone mode NOR Flash devices, NAND Flash devices with JFFS2 image or bootloader, DataFlash devices.” According to SAMA5D3 Series Evaluation Kits User-Guide, Ronetix is not the only company providing SAMA5D3 CPU modules for Atmel evaluation kits, as Embest modules are also available, but I could not find any info on those. You can find more information on Ronetix SAMA5D3x-CM page.